This past weekend, Yvonne and I were excited to host our 2nd Annual Easter Lunch and Egg Hunt. It was a picture perfect southern California afternoon with clear blue skies and not a cloud the sky; the perfect day to enjoy an outdoor lunch with friends and their adorable kids followed by crafts and an egg hunt by the duck pond. On the menu: a beautiful Cheese Platter, Roasted Red Pepper Hummus with homemade Whole Wheat Pita Chips, Roasted Veggie Sandwiches on Olive Oil & Herb Focaccia, Turkey Sandwiches with Arugula and Lingonberry Jam, Whole Wheat Orzo Salad, Spring Salad with homemade Orange Vinagrette, Fresh Fruit and a Dreamy Lemon Curd Tart with Fresh Berries. Then it was down to the duck pond for the hunt! As usual, there was a take home treat for the parents. To go along with the healthy theme, Yvonne baked these delicious Oatmeal and Carrot Spice Muffins. 3. Set up you muffin tray with paper muffin cups. Spray them lightly with spray oil. In a large bowl, combine flour, baking powder, baking soda, salt, cinnamon and baking spice. Mix till well blended. Add all the Oats and Oat cereal, coconut and raisins. Mix till all blended. Add Carrot and combine, do not over mix. Add the carrot mixture to prepared paper muffin cups. Fill cup to ¾ full. Serve warm or cold. Enjoy!! We hope your Easter is blessed with good friends, good times and of course, good food!! Well,this cookie has a very interesting story behind it. My co- worker at the office had made some oatmeal filled cookies which inspired me to try my own version of these cookies. Since I had a friend in town visiting from Indonesia, it gave me the perfect opportunity to bake these for her and my other girlfriends as little gift. So I started searching for the right recipe and filling. Of course I went to my favorite Pioneer Woman, and of course she had already made something similar for her family. So I decided to use her basic recipe except change the oats and add some freshly toasted pecans . As for the filling, I really combined three recipes I found. I think my final result was delicious. So back to my story...I had just finished the dough when I noticed that my puppy was missing a staple the vet had just put on his leg for a little accident at the doggie park. So much for making these cookies, I put the dough in the refrigerator and headed to the Vet.... two hours later, I started the baking part of these cookies again. As the cookies were baking I started on the filling, but noticed I had only 30 minutes to head to LA and the cookies had not finished cooling and I hadn't even started assembling them! I finally had to resign myself that these cookies were not going to be for my friends. So at this time I covered the filling and started to get ready to head out. On my way out I let my boyfriend know there were freshly baked cookies for him and his friend to taste test and off I went. After a great dinner with good friends, I came home to finish assembling the cookies and what do I see? Only 16 cookies left of the forty plus cookies I made! I guess two things can be said...the cookies are amazing enough to stand on their own and only 8 cookies became Whoopie pies. But let me tell you those were 8 delicious cookies! The cookie is soft and crunchy. The toasted pecans gives them such a wonderful favor. The filling is creamy and not too sweet with a creamy lemony flavor. I hope you give this recipe a try. They were delicious! Place pecans on a cookie sheet. Once cooled, chop and set aside to add to cookie dough. Line cookie tray with parchment paper. Mix the oats and flour together, set aside. Mix together brown sugar, butter and shorting. Add eggs to sugar mixture, and mix to combine. Add salt,cinnamon and baking powder to the mixture and mix to combine. Mix the baking soda with the water (it will bubble up), add this baking soda mixture to the sugar and egg mixtue. Mix till everything is incorporated. Add in the flour/Oat mixture and the roasted pecans to the batter. Mix but do not over mix. Just make sure everything is incorporated. Scoop dough on to the lined cookie tray. The dough should look like balls. Remove from cookie tray and cool on rack. Mix together for about 3 minutes. If its too soft , place in refrigurator for 30 minutes. Take one cookie, add 1 tablespoon of the filling and add the second cookie for the top. Lightly press together. Put on rack till all finished. You can also refrigerate them for about 30 minutes so the mesh together better. There's no disputing the fact that Donuts are one of America's favorite breakfast treats. They're sweet, delicious and portable, but can leave you feeling a little guilty for eating them. Now you can enjoy a healthier version that's baked, not fried thanks to the donut pan! If you're a fan of donuts but are looking for a healthier alternative, I encourage you to get one (or two!). Since I received my donut pan for my birthday last year, I've been putting it to good use. This recipe is one of my favorites. It combines two of my favorite ingredients - fresh blueberries and lemons. Since both the jam and the glaze have sugar in them, I cut out a lot of the sugar in the base recipe. I've even made it without any sugar in the batter and the results, in my opinion, were just as good. This is also a great base recipe that can be customized however you want. Use a different type of fruit for the jam, change the flavor of the yogurt or subsitute sour cream, use orange juice and zest instead of the lemon or even meyer lemons when they're in season. The possibilities are as endless as your imagination! Combine the cornstarch and cold water in a small ramekin. Stir the cornstarch/water mixture to recombine and add gradually to the jam while stirring. Allow mixture to come to a boil, stirring frequently. Place the jam in a small bowl to cool. Place the powdered sugar, milk, lemon zest and vanilla bean and lemon zest in a medium size bowl. Whisk to combine. If glaze is too thick, add a little more lemon juice until you reach your desired consistency. 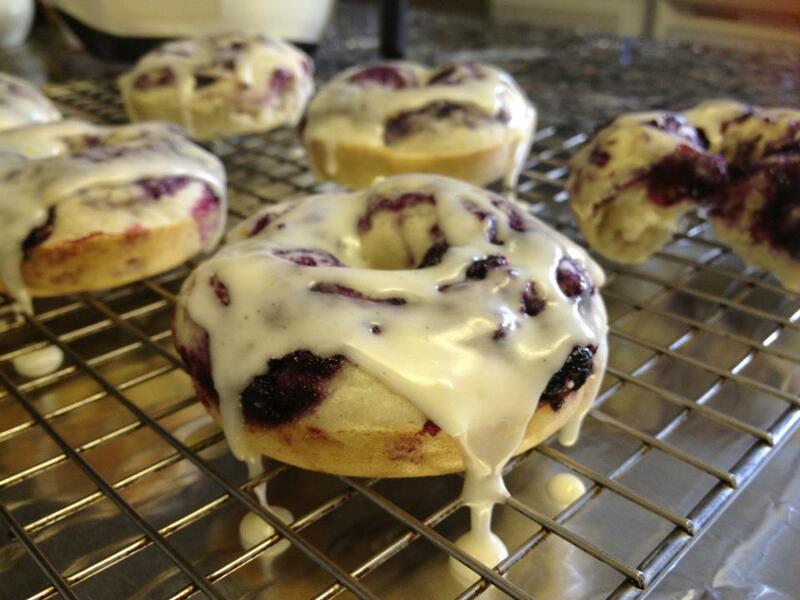 Set aside while you make the donuts. In a large bowl, whisk together the flour, baking soda and salt. Add the eggs, vanilla extract, melted butter, milk and yogurt. Whisk until well combined. Pour about 1/4 - 1/3 cup of batter into each of the cavity of the prepared donut pan. Make sure the batter is in an even layer. Dollop about 1 1/2 teaspoons of jam on top of the batter in each cavity. Using a small, sharp knife, swirl the jam into the batter. Bake for 5-6 minutes or until done (donut should spring back when lightly pressed). These donuts bake up pretty fast so be sure to check early. Remove from oven. Cool in pan for 1 minute, then loosen and remove from pan. Place on a cooling rack placed over a baking sheet. Since most donut pans only have 6 cavities, you'll need dto repeat the baking process until all of the batter is used, respraying the pan as needed. Serve immediately or at room temperature. These donuts are best enjoyed the day they are made but can be stored tightly covered at room temperature of up to 1 day. The concept of "springing forward" every year is great; you gain an extra hour of sunlight (yay!) but losing an hour of sleep hurts. Somehow these cinnamon rolls made it all better. Normally Cinnamon Rolls take hours to make, require hours of rising time and advance planning otherwise you're enjoying them just in time for lunch! This recipe only requires 30 minutes to rise thanks to the rapid rise yeast and they still produce, light, tender, delicious rolls. Next time you're craving homemade cinnamon rolls and don't have 4 hours to spare, try this simple recipe. Place the milk and cubed butter in a microwave safe bowl and heat in the microwave for 1 minute and 30 seconds. Remove from microwave and stir to melt the butter. Allow to sit at room temperature until barely lukewarm. In the bowl of an electric stand mixer fitted with the paddle attachment, combine the 2 cups of flour, sugar, yeast and salt. Mix to combine. Add the milk/butter mixture that is now barely warm and the egg. Mix until well combined. Remove the paddle attachment and switch to the dough hook. Add the remaining 1 1/4 cups of flour. Mix until combined. The dough should come away from the sides of the bowl and just stick to the bottom. If dough looks too sticky, add the remaining 1/4 cup flour and mix. Continue to mix/knead the dough for 5 minutes. Dough should feel smooth and slightly tacky. Remove to a well floured surface and rest for 15 minutes. While the dough is resting, make your filling. In a medium size bowl, combine the well softened butter, brown sugar and cinnamon. Mix well to combine. My filling was a little difficult to spread because my butter wasn't softened enough. Make sure your butter is super soft, almost slightly melted. For the brown sugar, I used a mixture of both light and dark brown sugar (or Golden Brown Sugar would work).I've found that the flavor using only light brown sugar is too subtle and all Dark Brown sugar is too strong. A mixture of both (or using Golden Brown Sugar if you can find it) is just right. Flour your rolling pin and roll the dough to a 12"x14" rectangle. Spread the butter/cinnamon/sugar mixture over the surface of the dough leaving a small area uncovered along the upper edge of the dough. Starting with the side closest to you, roll the dough into a log making sure to roll tightly. Position the seam underneath. Cut the log evenly into 12 slices. Use a sharp serrated knife, a sharp bench scraper or dental floss. Some people swear by the dental floss method for nicely cut rolls, but Im usually too lazy to go upstairs to get dental floss so I haven't tried this method yet. Place the rolls into a 13x9" glass pan sprayed with nonstick spray or well coated with butter. Cover loosely with a light kitchen towel and allow to rise for 30 minutes in a warm, draft free spot. My house wasn't very warm, so I preheated my oven to 250 degrees then turned it off. Then I placed the rolls in the warm oven to proof. After the rolls have risen for 30 minutes, bake in a 350 degree oven for 15-20 minutes or until lightly browned and the centers are done. In a large bowl, cream the cream cheese, butter, powdered sugar and vanilla bean paste with an electric mixer until smooth and creamy (approx 2 minutes). Adjust consistency if needed by adding more powdered sugar if needed. Add a splash of heavy cream, and mix to combine. I like adding a splash of heavy cream to my glaze for creaminess and extra richness. If you don't have vanilla bean paste, you can use a combination of vanilla extra and vanilla bean seeds, or just plain old vanilla extract is fine, you just won't have those beautiful vanilla bean seeds running through your glaze. Remove the rolls from the oven when they are lightly browned and the centers are done. Allow to cool for a few minutes then slather with the glaze. Serve warm with a nice cup of coffee. Looking for a quick delicious dinner? This recipe is perfect. I was craving fish and was looking for a new way to make it. I had bought some Panko a few weeks ago, so I thought this was a perfect opportunity to use it. So there you go, Panko Crusted Tilapia. What I liked about this recipe was that it was very easy and quick to make. Pretty much combine, coat and bake! Everything within 1 hour. The fish is flavorful, flakey and moist. It was definitely a hit with the boyfriend since he got up for a second serving. Serve it was some Roasted Asparagus and some Couscous for a perfect weekday dinner. 1. Get two shallow bowls. 3. Rinse fish and set aside. 5. Chop Italian Parsley and set aside. 4. In one bowl, add Panko, pepper, chili powder, Parmesan and chopped Italian Parsley. Mix together and set aside. 5. In the second bowl, add the melted butter, lemon juice and garlic salt. Mix together and set aside. 6. Take the fish, dip in the butter mixture. Make sure it is fulled coated. Then quickly add to the Panko mixture. Make sure both sides are fully coated. Repeat til complete. 7. Take the fish and put on top of the wire rack. 8. Bake for 15 minutes. Fish will be flakey and crispy.